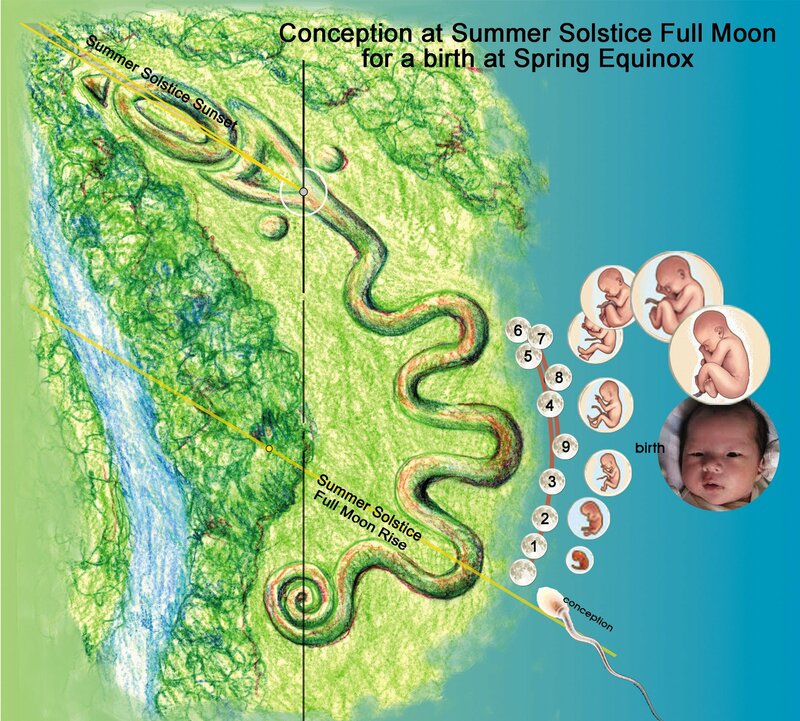 David has shown that Serpent Mound registers the full moons closest to the solstices and equinoxes (solar cardinal points). Due to the moon’s 18.6 year “wobble cycle”, it would be difficult for ancient people to predict the exact place for the full moon rise because it can show up on either side of the average position within a certain margin of error. So, the broad curves were created to indicate the range of it’s variability. By using broad curved pointers it caught the scatter of the full moons that were closest to those solar cardinal points and encased them in their own curves. That is why we think that Serpent Mound could have been used as a lunar calendar. Sisters In Spirit Grandmother Moon. 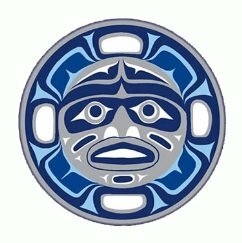 Indigenous people recognized using the energy of the moon to amplify natural events, mainly planting and harvesting. Full moons in particular where given names, and each tribe had different names that corespondent to events in their geographical season. The Strawberry moon was when the strawberries become ripe. The Maple Moon was when the sap was ready to be harvested from the Sugar Maple trees. There was the Flower Moon, Wolf Moon, Snow Moon, Corn Moon, which is the moon nearest to the autumnal equinox, and of course the Harvest Moon. But plants are not the only thing affected by the moon. The most obvious to women is women themselves. The fact is that women’s bodies do synchronize with the phases of the moons, and “there is a relation between the astronomical and the biological” (4) Menaker and Menaker reveal that the “28 days in a menstrual month” that has been stated in medical text is an arbitrary number and is false, and because of that “any demonstrable relation between lunar and human sexual or reproductive phenomena has been doubted or denied in a number of reports on the human menstrual cycle”. In their study they used the synodic lunar calculation, which is the time from new moon to new moon, because they realized that women’s bodies cycled with the moon. The synodic lunar (or sun-moon) month is 29.5 days. At which phases of the moon do women menstruate and ovulate? When interviewing the Six Nations of the Iroquois, Shimony found that, participation in the Strawberry, Raspberry, Maple and Mid-Winter festivals were dated five days after new moon to allow Iroquoian women to complete the menstrual period, which was believed to coincide with new moon. (3) This implies that not only were women’s periods synced with each other, but that they menstruated at the dark of the moon, or the new moon. So one of the important signs or functions of a full moon was to reveal when women were at their most fertile time or, scientifically put, when they were ovulating. Grandmother Moon Mask. 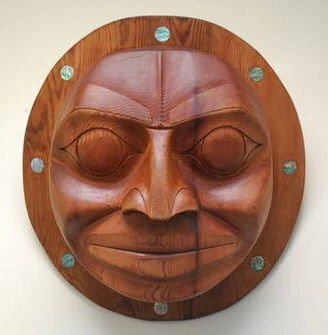 Red Cedar Carving by Native American Artist Richard Cochrane. The best anthropological evidence of menstrual synchrony in Native American cultures is Thomas Buckley study of the Yurok Tribe of California. One Native American women stated her aunts and grandmother told her “that a menstruating women should isolate herself because she was at the height of her power. During her ‘moontime’ she should meditate on the nature of one’s life, to find out her purpose.” Furthermore, and in the old days, “if a women got out of synchronization with the moon and with other women of the household, she could ‘get back in by sitting in the moonlight and talking to the moon, asking it to balance her”. (1) Not only does this suggest synchronization with the moon but with other women. In a small village this would mean that a signification number of the women would be participating in menstrual seclusion. Archaeologist, Patricia Galloway discusses this in her essay “Where Have All the Menstrual Huts Gone, stating that the “hut” must have been larger than previously anticipated by archaeologists. In a contemporary study on menstrual synchrony, it would be hard if not impossible to replicate the living conditions of those societies that claim it’s existence. However, Buckley points to Dewan, Menkin, and Rock (1978) who have demonstrated that menstruation may be directly affected by the exposure to light. Menstrual synchrony has also been shown to effect women who live within small groups, Martha Mc Clintock (1971,1981) And a new study, Menstrual Synchronization: a Qualitative Study by Klebanoff and Keyser confirms this again. Is there a best time of year to have a baby? A study from Princeton University says that in terms of birth weight, summer was the best time to conceive. Mothers who conceived from June through August (which is around the summer solstice) gained more weight during their pregnancies and gave birth to infants who were, on average, about 8 grams heavier than in other months. (5) Did the Native women learn this from seeing animals give birth in spring? 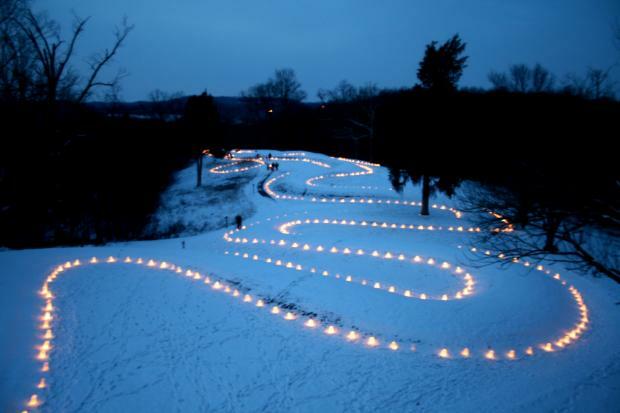 How does Serpent Mound count moons? David and I wondered how and if Serpent Mound would register nine moons starting from the time of a conception. Or as Menaker and Menaker put it, a “child conceived on a given day of the lunar month would, on the average, be born 9 lunar month’s later on the same day of the lunar month.”(4) We tried it out. David wrote a computer program that simulated the full moons positions for several hundred years. Starting from the full moon nearest summer solstice and counting nine full moons, we land within the curve of the full moon closest to the Spring Equinox. 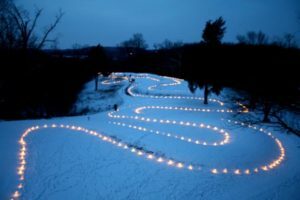 It seemed that Serpent Mound could indeed act as a kind of lunar calendar that could plan the conception, measure the length of pregnancy and forecast the birth of a child. David’s investigation of the Serpent’s head alignment has led us to believe it may have been another kind of marker for a lunar event. It could have purposely been designed to alert women to the fact that the next full moon would be the full moon nearest the summer solstice. That full moon would appear in the opposite direction, in the southern curve, rising as the sun sets. The summer solstice does not always coincide exactly with the full moon, but a full moon is guaranteed to occur within about two weeks either side of the solstice. If light effects ovulation this would certainly be a perfect time for conception. At the full moon nearest summer solstice the earth would be at it’s brightest. After the long bright day of summer there would be the long bright night of full moon light. See David’s analysis for more details. The summer Solstice sunrise appears in the northern curve and sets in near alignment with the Serpents mouth. The moon is opposite to the sun. In the summer, when the sun is to the north, the moon is to the south; and in winter when the sun is to the south, the moon is to the north. So, in the summer the full moon that is closest to the summer solstice appears within the southern curve. In fact, the full moon will rise at the exact time the sun sets, but in the opposite direction. So, if a woman stands at the mouth or opening of the southern curve, and faces east, she will see the full moon rise within that curve. This year I got to experience that with my sister and niece. It was spectacular. There are a fair amount of conjecture in this thesis concerning the anthropological conclusions, but the astronomical science is correct. Serpent Mound does chart the full moons around the cardinal solar points. No one can say exactly whether Serpent Mound was used in calculating pregnancies or not, but we have shown that it could be used to do so. I believe Native American oral history is important when studying these mounds. Dr. Mann told me, “you have to understand the cultural context to understand the mounds”. I suggest her book “Land of the Three Miamis” to help understand that culture. Dr. Mann states in her book that the Iroquois nations were headed by women, but, this was after a great cultural civil war against oppression, where the Great League of Peace started by women and men prevailed. How exactly Serpent Mound was used and how it coincidences with Indigenous history is not known by this author, but perhaps could be answered better by Indigenous people versed in their own history.